This was always going to be a long day, but when I turned up at the Trenchford Reservoir car park and realised I didn't have the £4 for the Pay and Display, I had to pop down to Bovey Tracey to get some cash. When I got there I saved myself a quid and left the car in the town with my route lengthened. A valuable thing to remember when walking on the fringes of the national park is that there are a lot of valleys and plenty of ups and downs. A day spent rambling in these spots can lead to more ascent than that achieved on the high moor. Straight off East Street, by the church, the incline on the road hits you. It is no easier when you leave it for a byway, although you are afforded plenty of views to encourage breathers. 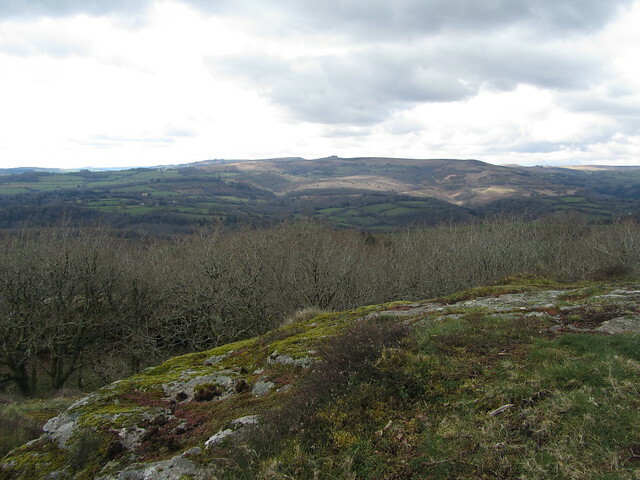 The higher you climb, the greater the panoramas of the high moor to the west; Haytor prominent. 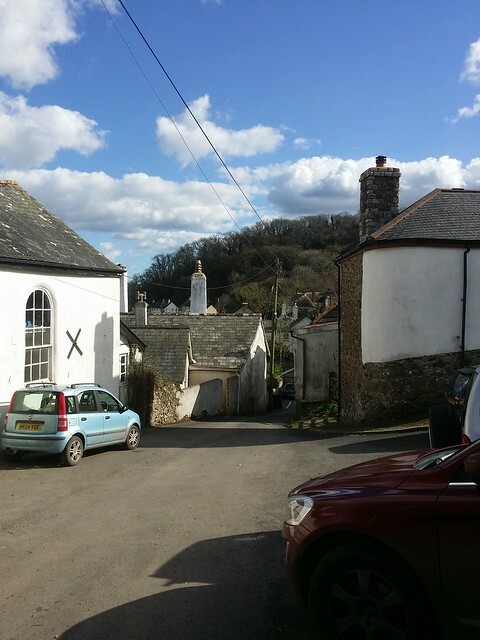 At Furzeleigh Cross, you have completed the first climb of the day, from a lowly 19 metres at the car park to a heady 216 metres beside Beechleigh Farm. 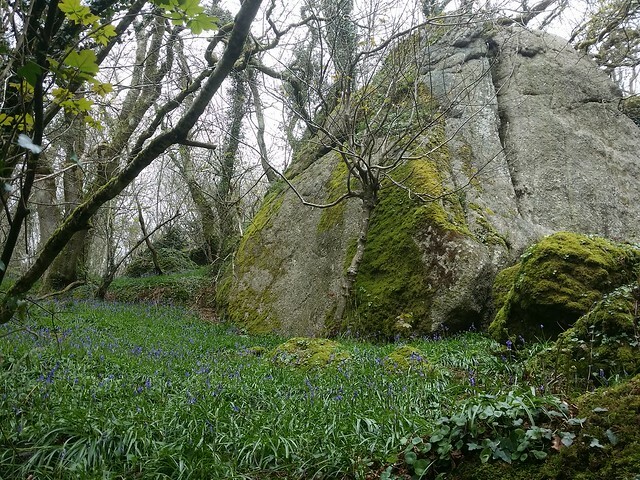 Passing along a lane called Little John's Walk, you begin to see the first signs of granite; plenty to see today! 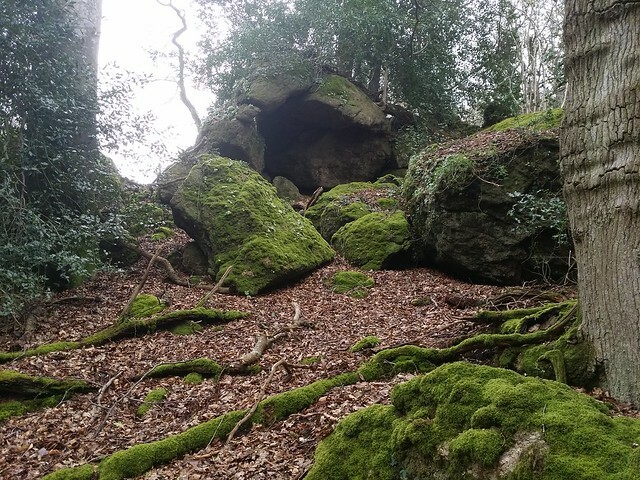 At first, I thought these broken boulders must be John Cann's Rocks, but continuing further passed the permissive entrance to Shaptor Woods, I came around a left bend to see the prize up to my left. Getting up there took some doing, with the lanes banks high at this point. Once that hurdle was over, there was some bramble tentacles to fight with, but well worth the effort. 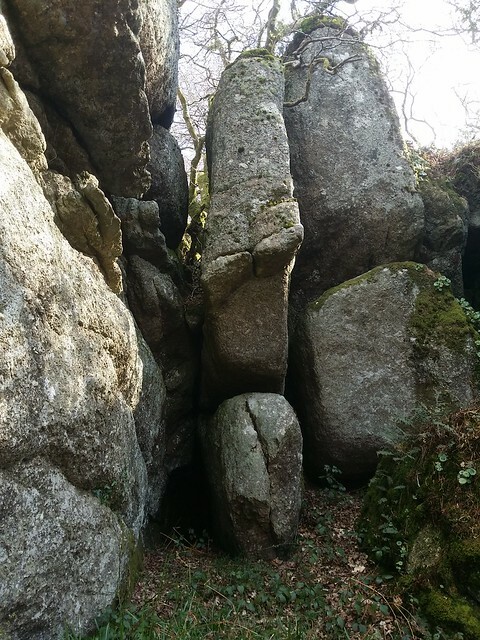 Technically, John Cann's Rocks are outside the boundary of the National Park. 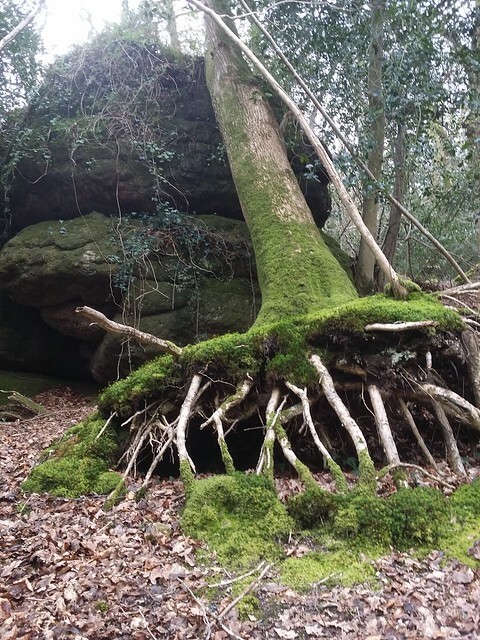 Ken Ringwood has included them in his book under the premise that the rocks, within Bearacleave Woods, are widespread and stray into Shaptor Woods, within the boundary. I won't argue with that, they are a worthy inclusion. 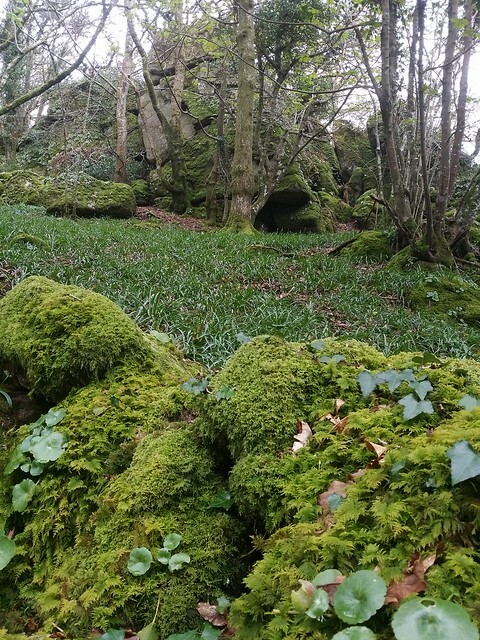 I returned to the entrance to Shaptor Woods, my walk taking me along a permitted path through to where I can head up to Shaptor Rocks. 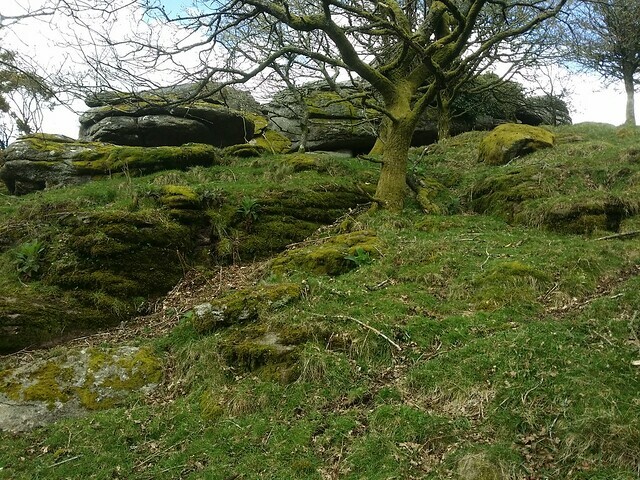 Little did I realise that the journey there would be waylaid by the hidden tors and rocks to be found just off the route! 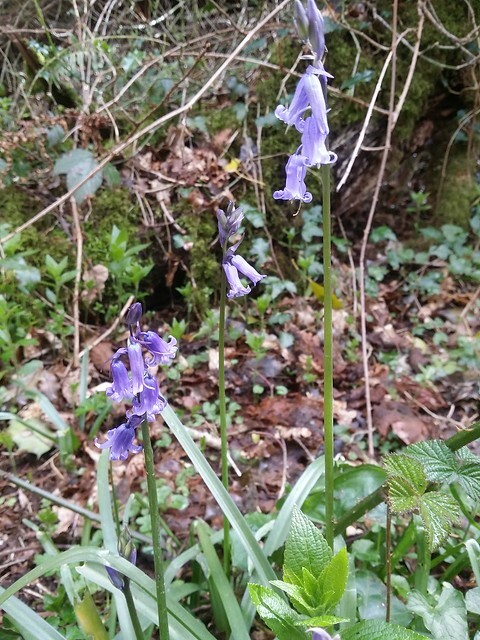 With spring finally here, the woodland floor is beginning to enter its most magical phase. 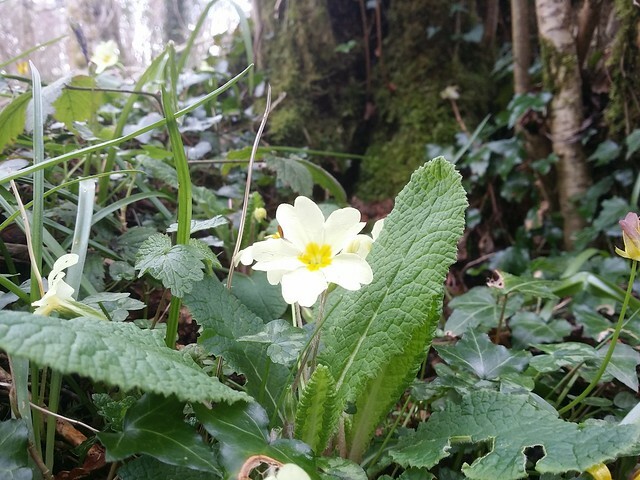 Bluebells and Wild Primrose are abundant, and I wager that it in a couple of weeks Shaptor Woods will be a picture postcard paradise! Making my way through the young foliage, I kept seeing the grey mass of outcrops beside the path. Eventually, it was too much of a temptation to remain on it, and I just had to enter the trees properly to explore. 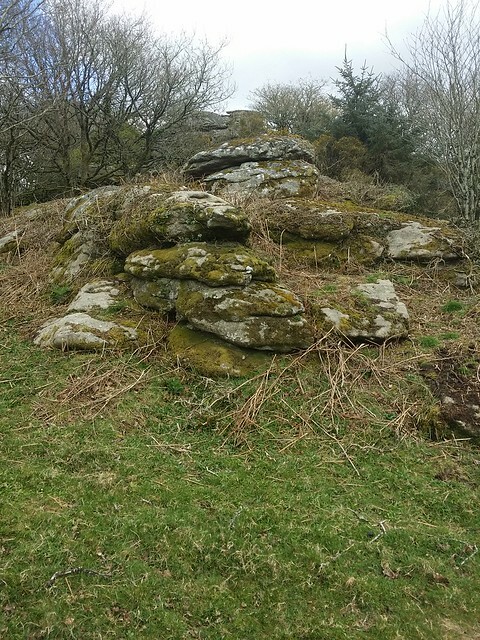 One particular outcrop, unofficially named by Tim Jenkinson as "Rock Copse (North West) Tor was to rival any of those on my list today. It's stunning, but made all the more picturesque by the bluebell "moat" around it. 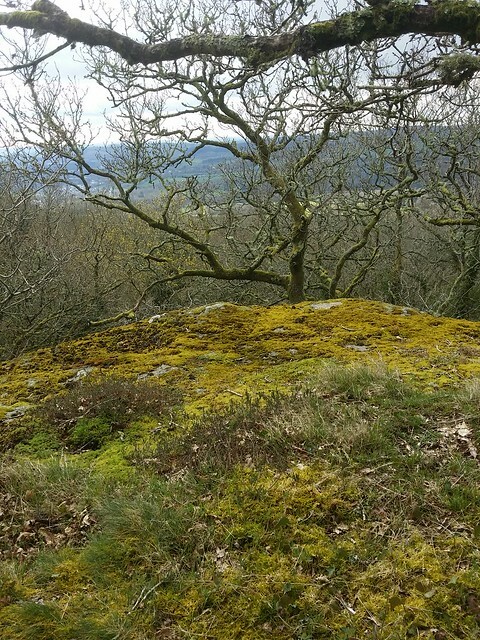 The more I wandered high above the path, the more I contemplated returning over the Bank Holiday when the flowers should be in full bloom. 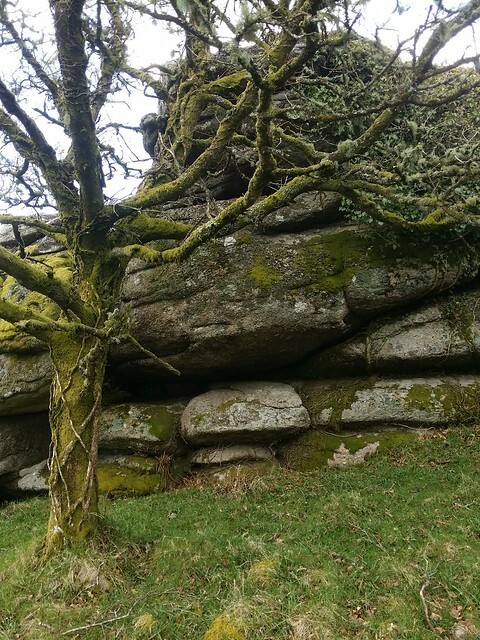 Another, further along, was Sonny Copse Tor, again named by Tim. Realising I wasn't going to achieve the objectives for the day, I, eventually, pulled myself away from this heaven and returned to the permitted path. At a junction, I turned right to bag Shaptor Rock. I spotted the lower outcrops to my right and stepped up to them. A semblance of a rough path snaked between the rocks and climbed higher. I popped out on a moss ledge, where the trees hid the vista, and so continued higher. Still not at the top, I found a wide ledge with a fine view to sit myself down and have a bite and crack open my flask of hot blackcurrant. Not even registered my second bag of the day and it was lunchtime, such were the number of distractions on today's route. 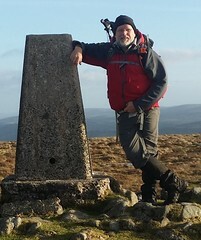 It took a minute or more to reach the summit once I resumed my walk, drinking in the scene before returning to the signed junction. I wandered into Shaptor Bottom Copse, momentarily losing the footpath amongst the rutted tracks of the logging vehicles. The path left the woods, squeezed between the trees on the hill and the gardens of some houses near Hawkmoor Park. Then another junction. I took the right fork, climbing up in the direction of Bell Lane. Almost immediately, I found a low section of the bank where a barbed fence had disappeared, and slipped through into the woods. 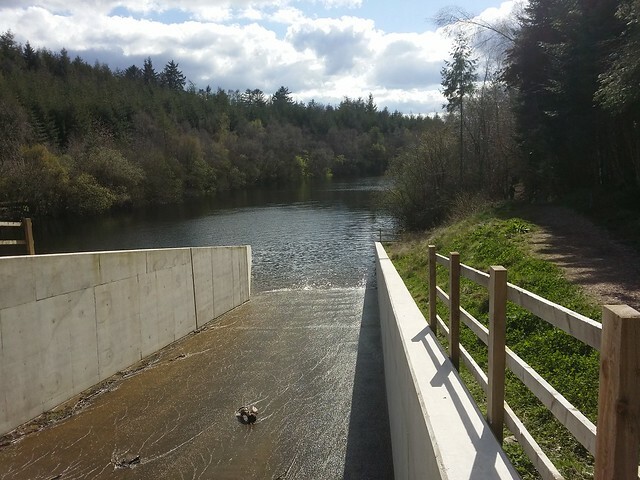 Although this is private land, it is accessible. 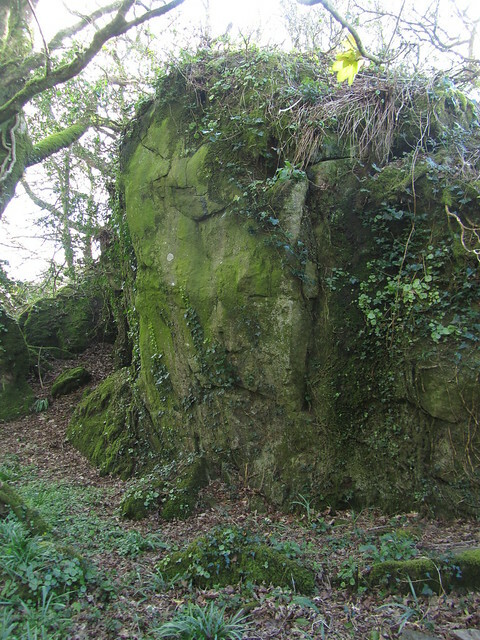 I carefully stepped up to Gladstone Rock, this rarely visited tor being overtaken by vegetation. On its north-eastern side, beside a wall and open field, you get the best view of the granite. 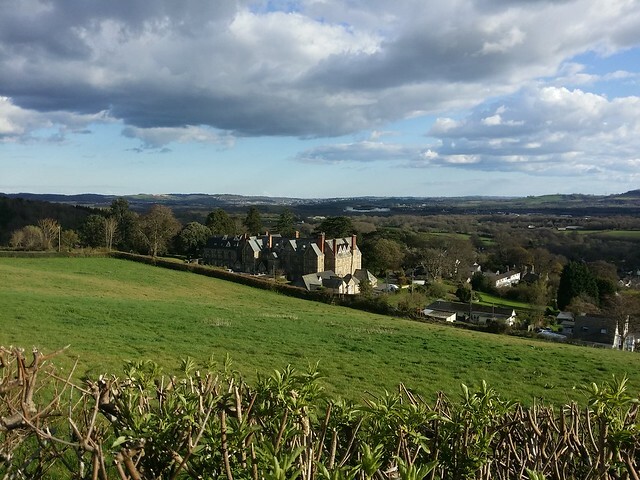 I had a choice of routes now; return to the path and ascend to Bell Lane, and take a long loop around to the footpath near Bullaton Farm, or head down for a walk along the A382 to a footpath near Kelly's Mine. I chose the latter. The walk along the A382 was a bit hairy, but for the most part it had a grass verge to avoid the worst of the traffic. Thankfully, when the verge ran out towards the end, the vehicles stopped coming, and I made it to the footpath without too many dramas. 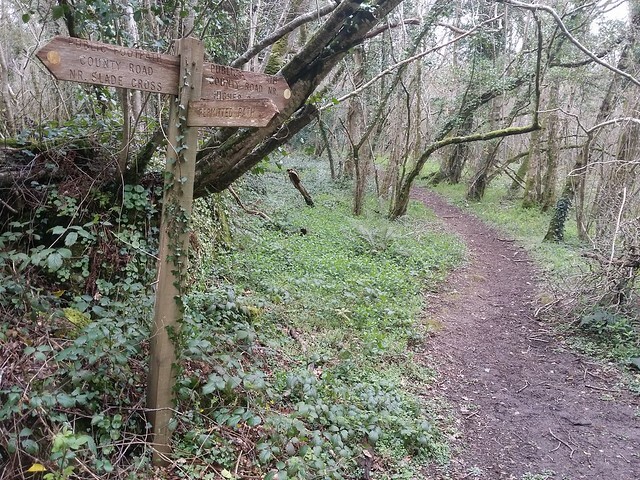 I joined the footpath into Tinhill Copse, on the outskirts of Kelly's Tin Mine. 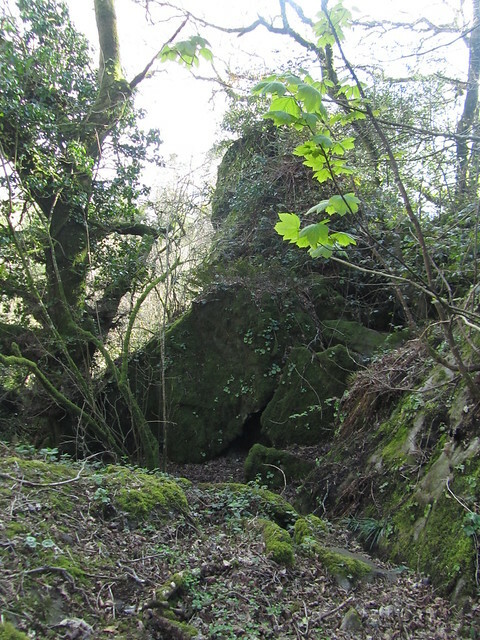 Although little of the restored mine can be discerned from here, evidence of mining is still evident with various ruined buildings in the woods. A short distance, I was offered two paths; an official public footpath or a permitted "easier" route and I chose the latter. It was still an effort, taking me by an unnamed outcrop to my right, on the other side of a low moss covered wall. I've since been told, by Tim Jenkinson, this is Kelly Mine Tor. 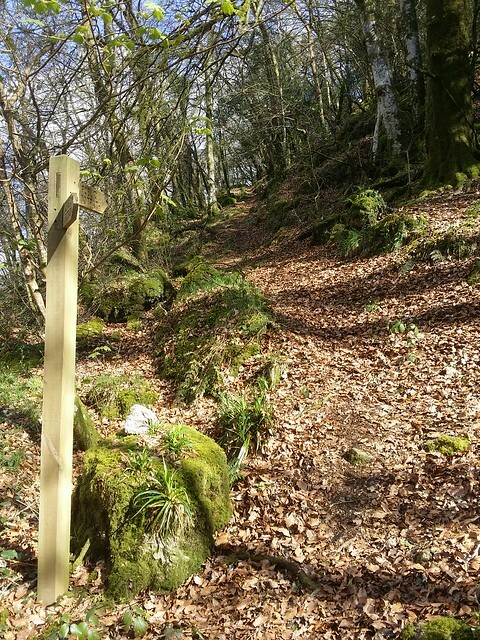 I'm not certain where the public footpath goes or if or when they rejoin, but I do know that as I made my way up this path, I could see my way to Bullaton Rock was going to be tricky. Assured, by Ken's book, that although on private land, it was accessible, I had envisaged an ascent through woodland to its base. But I was being escorted the entire way, on my right flank, by a new fence, topped with barb wire. It appeared an attempt to put paid to my plan and steer me out of the copse. I considered my options where the permitted path left the woods; If I had taken the original path would it have led me into the woods beyond the fence? Sticking to the path I was on meant a lengthy detour, via the road, whereas the other side of the fence there were clear tracks, made before the new fence was introduced. It would only take five to ten minutes to the tor that way, as opposed to a good half an hour on the road. I found a penetrable spot in the fence, and hopped over. 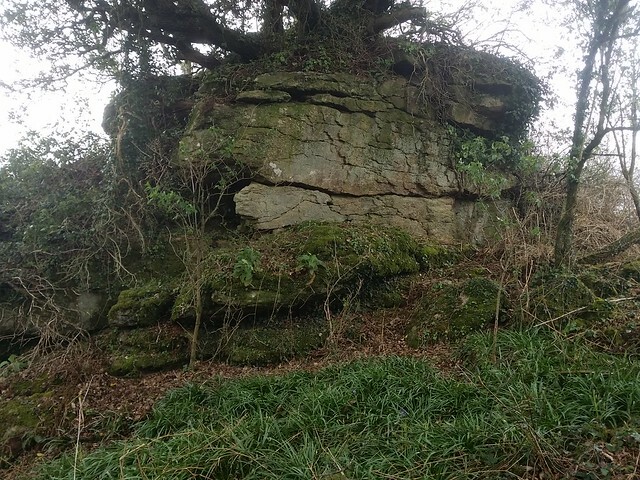 It was a simple walk through the copse, with a gate to negotiate before popping out into the edge of a field where the lovely hidden Bullaton Rock was placed. From its summit, the same views of the moor still captivated, although I didn't linger in full view on the exposed granite too long. Although Ken says this tor has permitted access, it sure didn't feel like it! 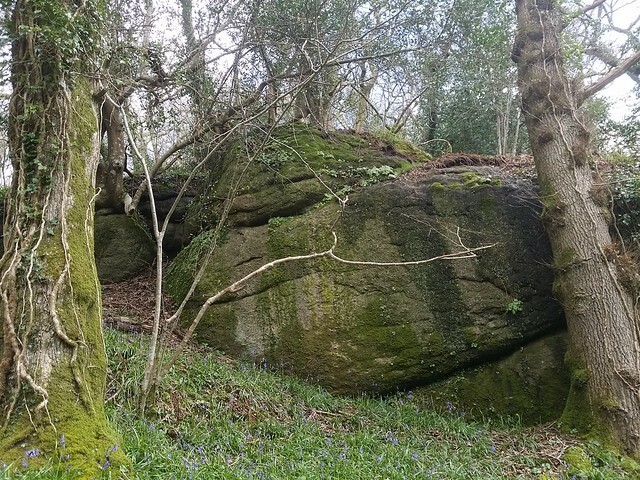 There is an eastward track, through three fields, to the road, which I guess must be the permitted path to Bullaton Rock; I took that to avoid more barriers. I followed the road down to Lower Elsford Farm, turning left on a footpath through the property to East Wray Cleave. 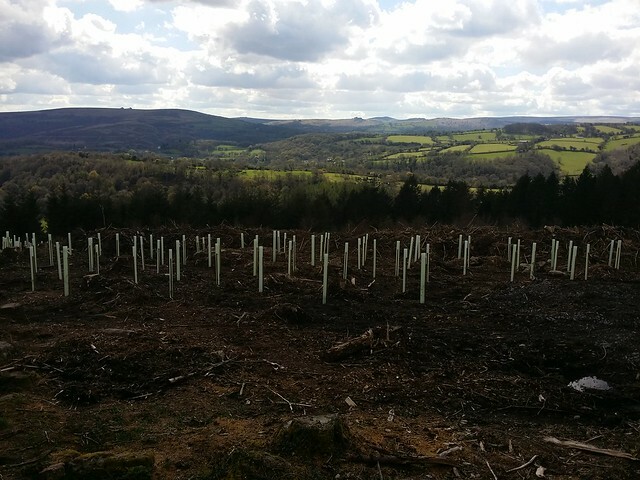 Managed by the Woodland Trust, the woods were undergoing some felling and replanting. A notice had been posted warning to keep to the footpath and not take any other tracks, but it also said the works would be finished by January 2016. 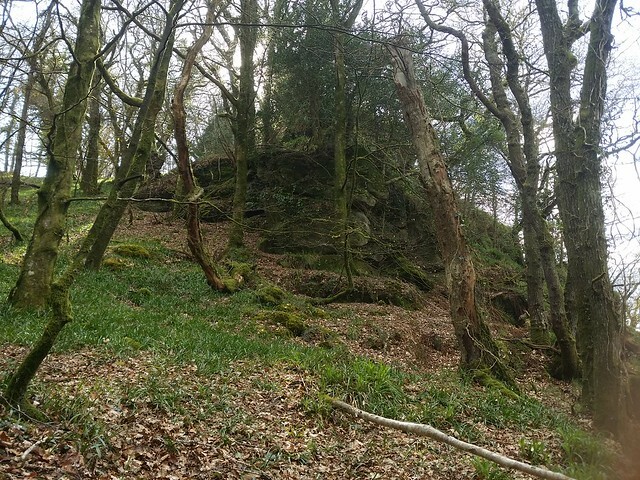 Assuming, three months later, it was now safe to wander, I left the public footpath soon after entering the woods, heading along a loggers track that contoured the hill. 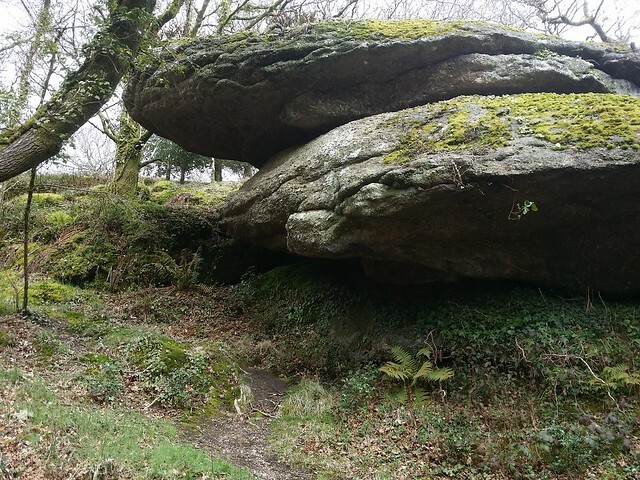 I reached its end, where it then turned right, climbing up to Elsford Rock. 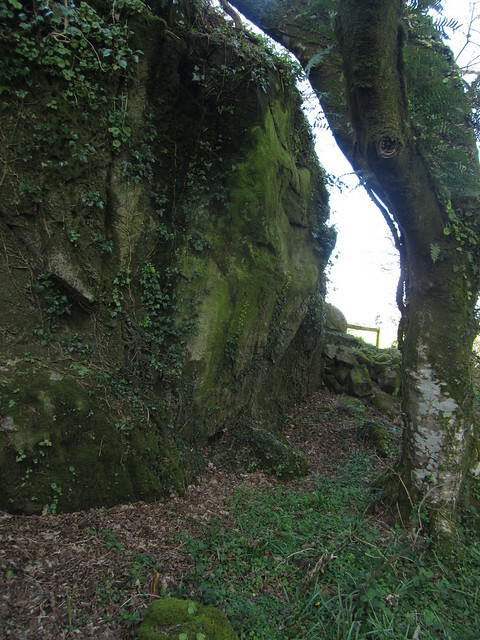 Elsford Rock sits at the top on the other side of a wall, within a field. As I have said before regarding tors on private land, restricting access to the public often seems churlish, and this one is a prime example. 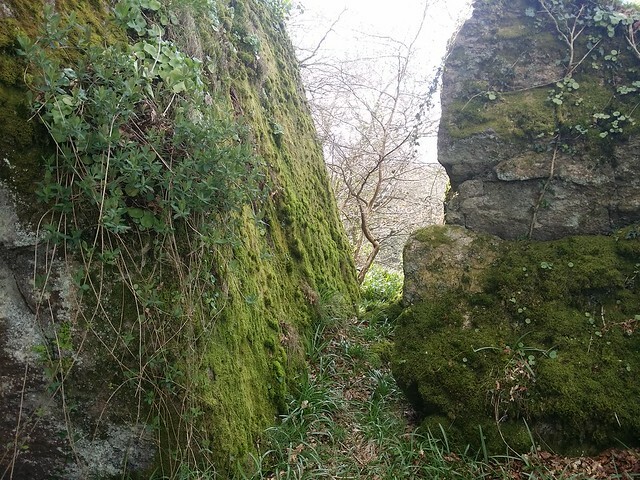 A half decent picture can be captured from the woodland side of the wall if you are not inclined to trespassing responsibly, but it is just a small portion of a great outcrop and a great shame not to visit it properly. 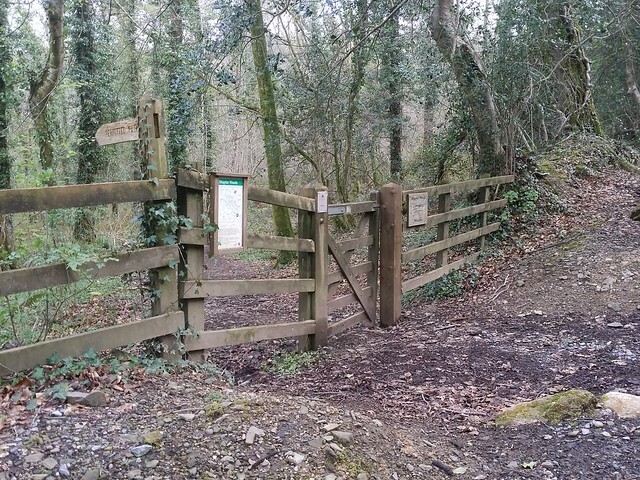 I left the cleave through an open gate that the loggers use for access, on a track beside Blackingstone Farm. This took me back to the road to Trenchford Reservoir, passing Lower Elsford Farm. A footpath eventually takes you from the road, through trees and heathland down to the reservoir. 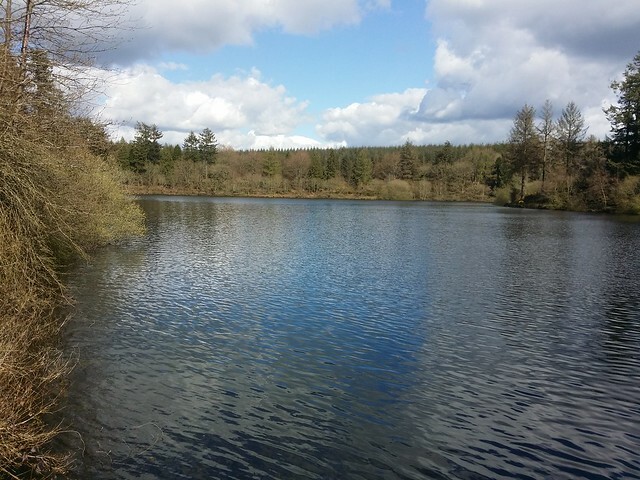 It is a peaceful meandering walk along its banks to the road that separates Trenchford and Tottiford Reservoir. I stopped for another break, beside Tottiford, finishing off my, by now, lukewarm flask of blackcurrant cordial. Two more tors to bag, plenty of daylight left, just my throbbing feet to consider after so much road walking. Another steep road descent entailed, down passed Tottiford Farm, to Beadon Bridge. 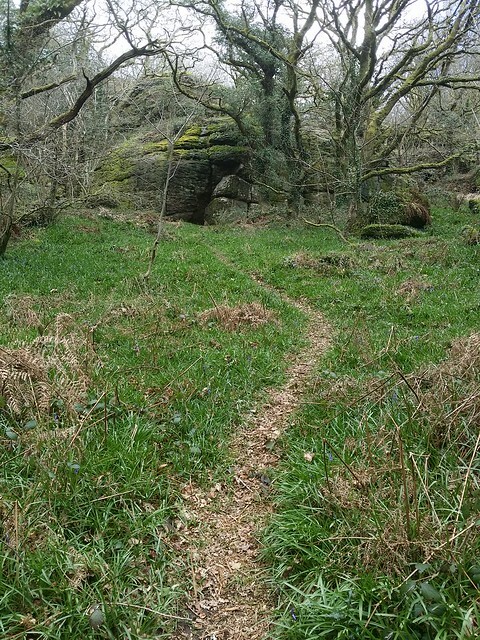 Here, a footpath goes left along the Beadon Brook before crossing and climbing up through Greatrock Copse. Signs warn of the dangers of straying from the public byway, the numerous closed mining sites on the hill an attempt to deter. To my right, I spot Great Rock. 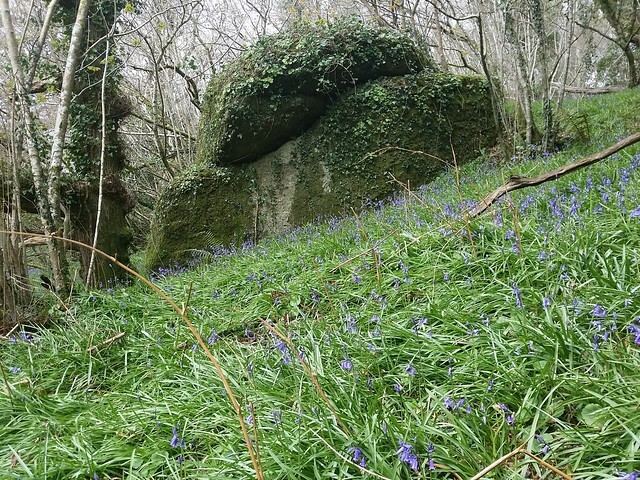 I leave the path, it's a steep climb, through fallen leaves and emerging bluebells, to the tor, but no more difficult than the previous woodland outcrops I've visited today. 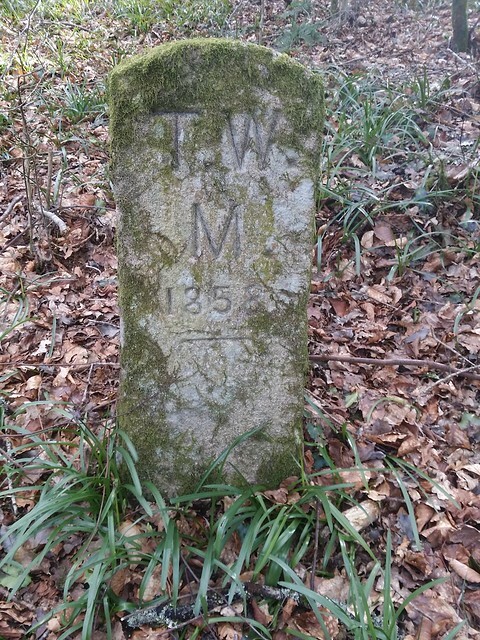 En route, I spot a marker stone for the Torquay Water Mains. Along the public footpath the piping for this now disused utility is visible beneath your feet. 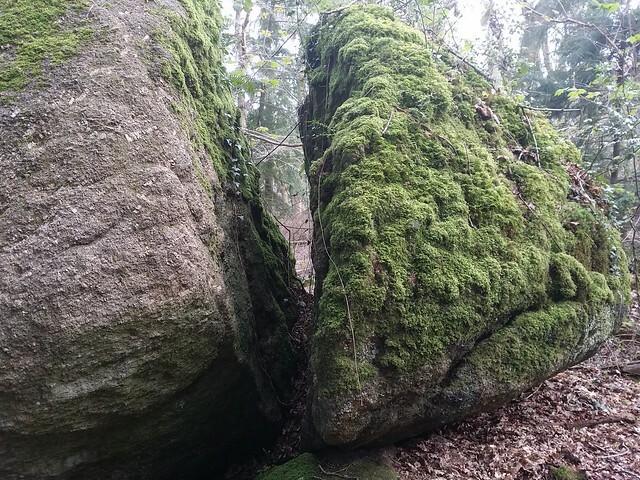 I reached Great Rock. Passing through a crack to a grassed ledge my explorations were halted by a steep drop. 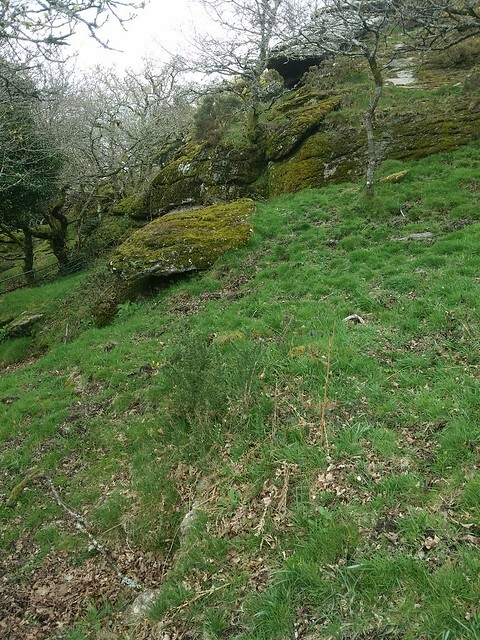 With the prospect of mine workings in my way, I descended to the footpath rather than maintain the height I was at to meet the path further into the copse. 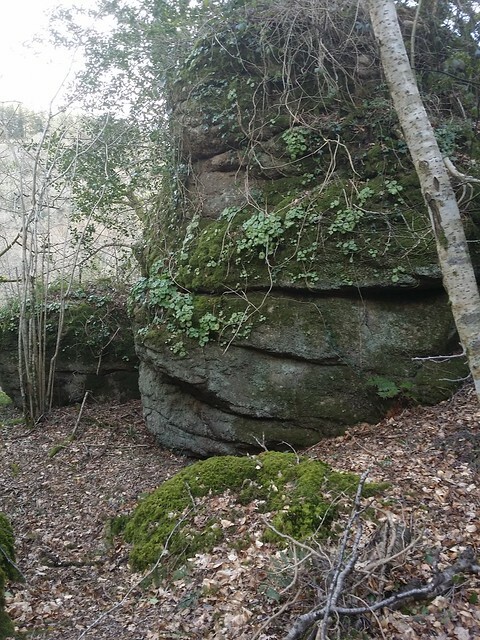 I could see many more outcrops within the foliage, but the possible hidden dangers were enough to make me press on. 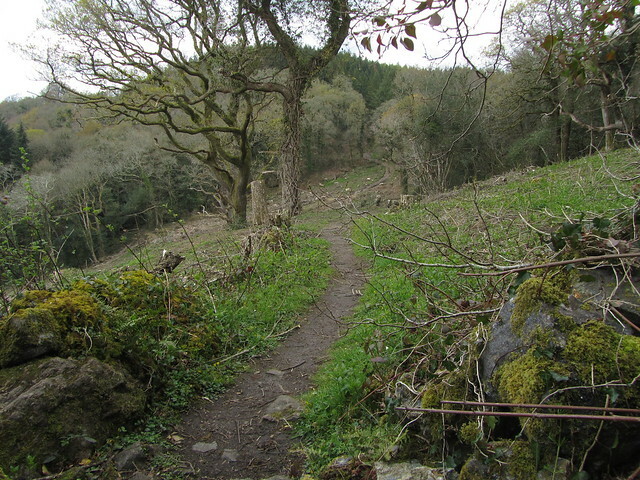 Soon the path dropped back down to a clearing where Greatrock Farm was situated and another stiff climb began! Mercifully short this time, I emerged out into fields and sunshine. Open fields turned to a road, that led into the village of Hennock. My drive through that morning had passed a lovely looking pub, but I still had plenty to do and so veered right on a footpath before entering the village properly. 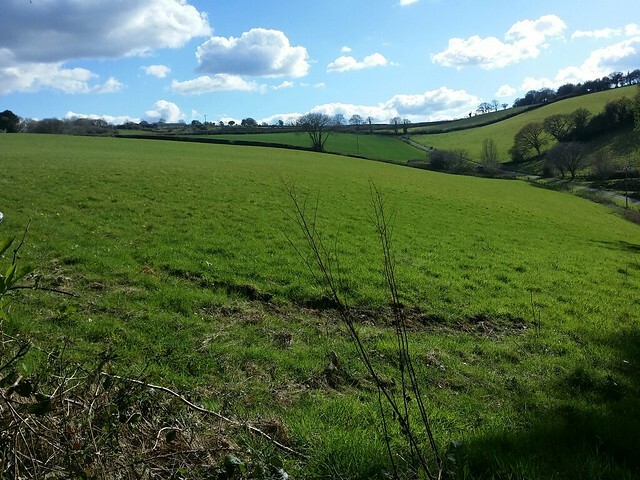 More fields, above the village, to Bell Lane, which I traipsed along, for half a kilometre, to a junction at Chericombeshead, where a left turn onto a bridleway awaited. 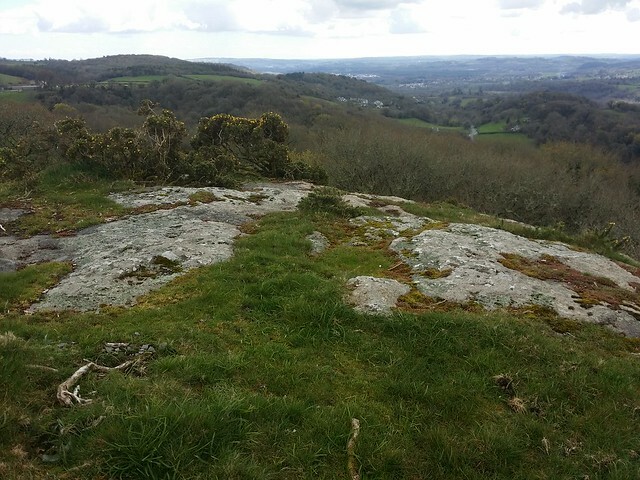 It was a slight incline for a few hundred metres, before I could catch a glimpse of Bottor Rock through the hedgerows. I feared this one may prove elusive but as the brow of the hill was passed, I had a better view where the lanes bank was a metre high. 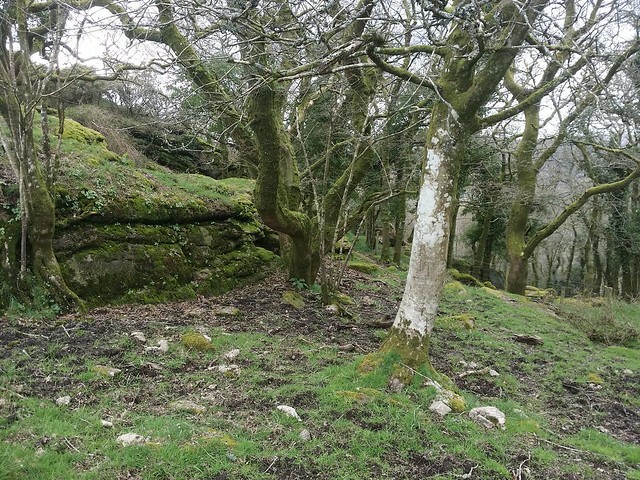 Situated some thirty metres from the bridleway, seemingly left to be forgotten within an unkempt section of forbidden wood on the side of the hill, this oh so precious private land is clearly neglected and not being used by the landowner. What harm would a simple permissive path to the tor do? 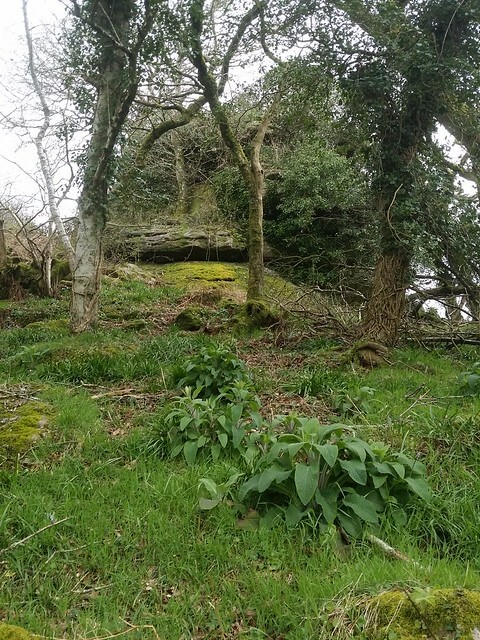 I simply stepped up onto the bank at a point where the barbed wire had fallen and meandered along a thin, obvious trail, through a carpet of wild garlic, to visit the rock. A two or three minute diversion, no harm or damage done to property or persons; quite ridiculous. 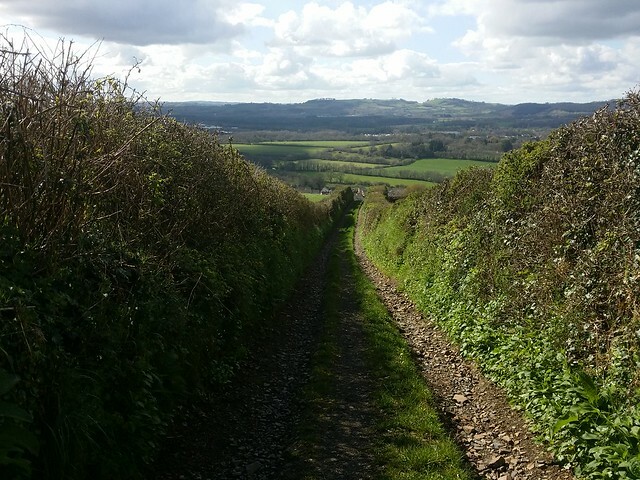 The green sunken lane down the hill was rocky and energy sapping. I came out at a road junction called Five Lanes and took advantage of a shaded bench for ten minutes, contemplating the successes of the day. 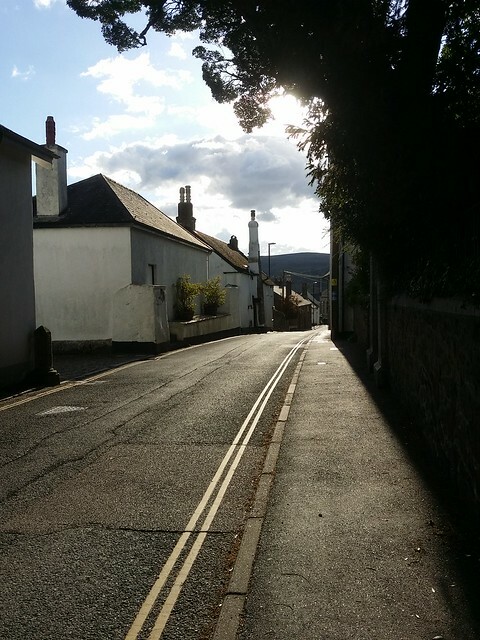 Now, all that remained was the push along metalled surface down to Bovey Tracey, not unpleasant in the late afternoon sunshine. 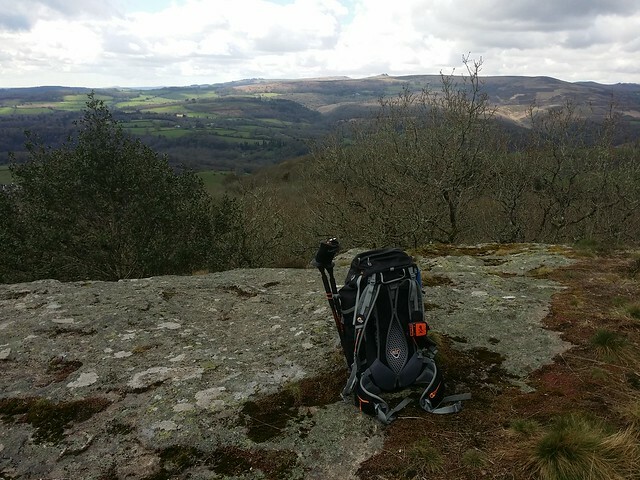 I stowed away my walking poles prematurely, just as I reached that steep lane down to East Street, and the final leg through the town had turned to a hobble after in excess of fifteen miles in over eight hours discovering the hidden granite of the woods above. Top day!